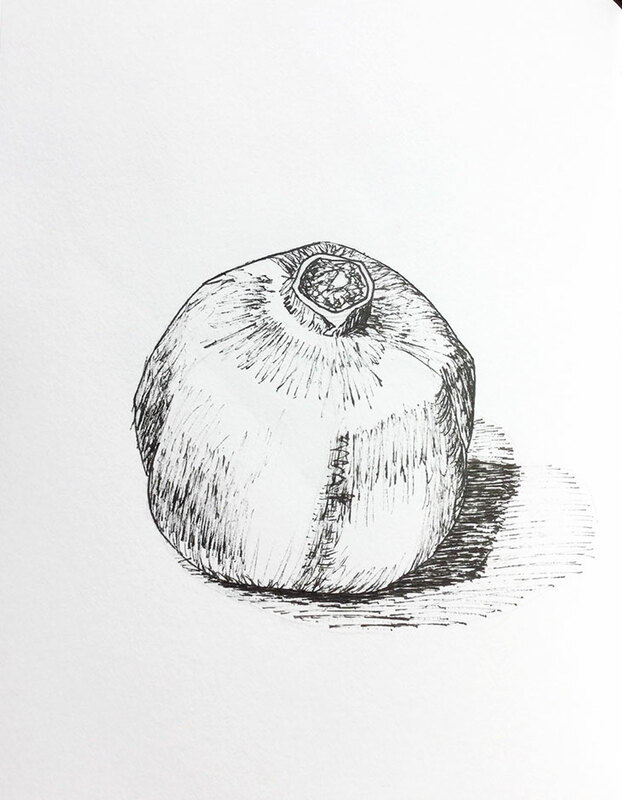 Past Drawing Practice student Jennifer Okano’s first Daily Potato—the vegetable that inspired everyone else. 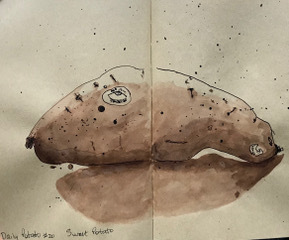 At the end of September 2018 Jennifer Okano brightened everyone’s day by posting this wonderfully dimensional sketch of a sweet potato in a group I host for past students. This month my focus has been on contours. Outside, inside, cross. Picking the oddest Japanese sweet potatoes at the market has given me a giddy pleasure. 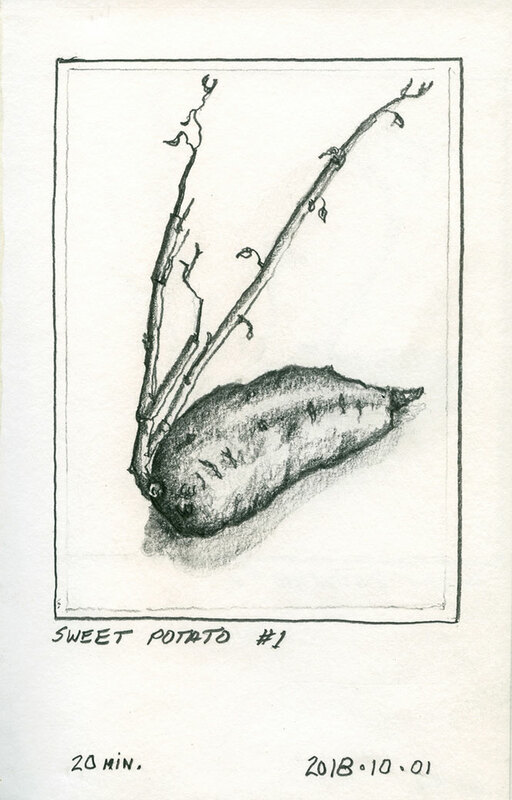 My kitchen is the land of misfit vegetables—even my children were questioning the bold point of this one I drew today. I tried to express the shape and volume with varied line weights and textures, and this project will most definitely turn into a long term journey. Usually I have been stopping (for now) before I think about shading, but it was too fun to try to show the shadow of the end suspended in space, and obviously give some weight to it. 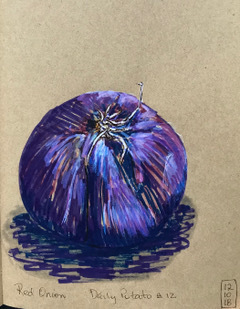 Prismacolor black grape on a random pad of mixed media paper. She then invited others to join in as she went off to draw a persimmon! 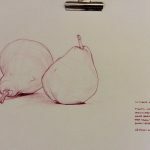 Several students gearing up for InkTober and other challenges, or simply looking for a new slant on their daily drawing from life practice, joined in. 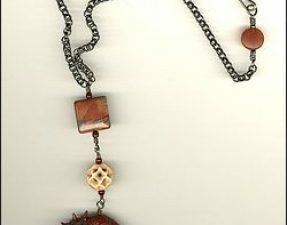 Some of what they produced is included in the gallery attached to this post. 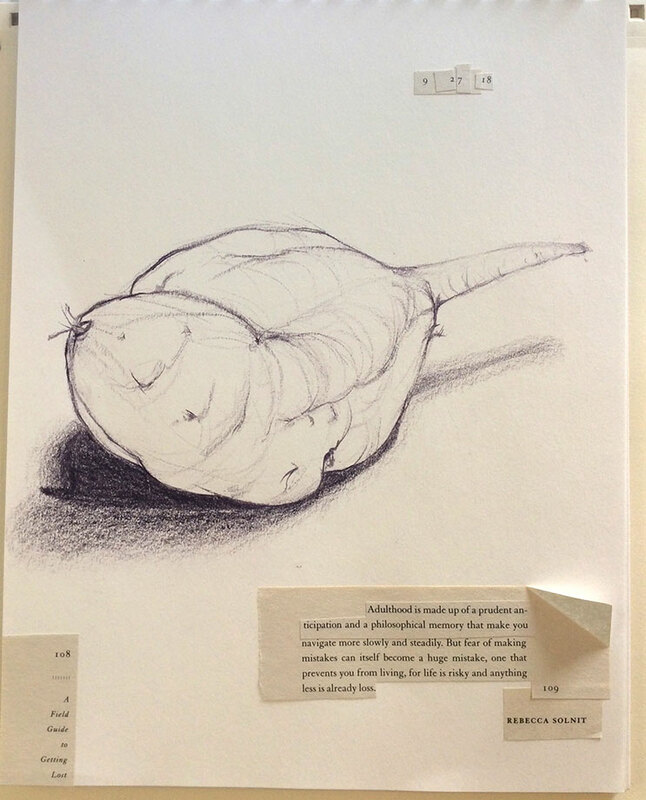 Each sketch is a little gem, a moment in time in their lives and in their creative process. 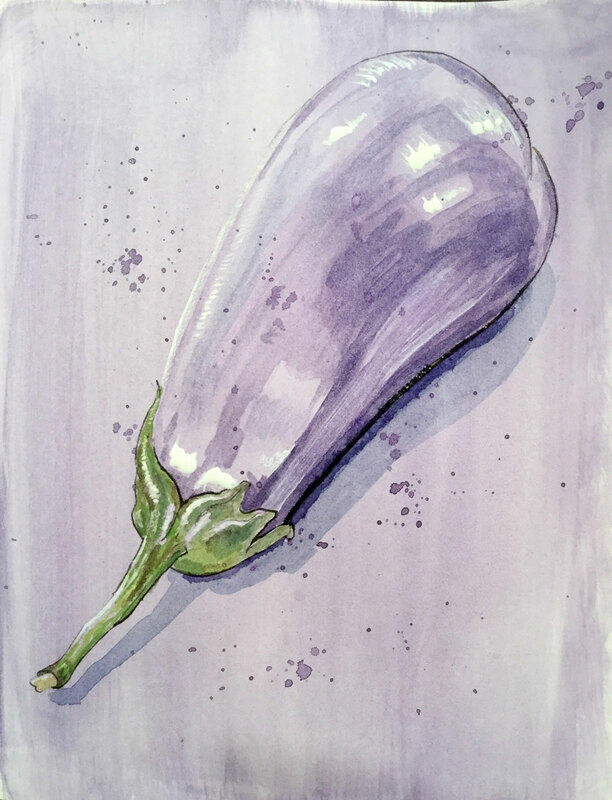 Each artist is looking to see with fresh eyes the produce that they use each day. 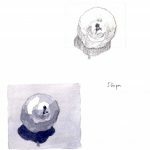 I asked if I could share their work and their thoughts about the project with you. I hope that their words will inspire you to think carefully and intentionally when you set up a daily project. I hope you will see how simple, humble subjects can challenge and enrich our abilities. 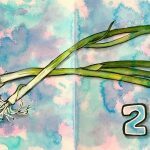 I hope that you start your own daily challenge, based on your own art goals and skill levels—whether you work by yourself or you invite your art friends to join you. 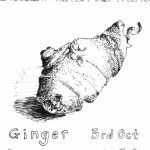 I have listed the artists alphabetically and have posted their related sketches immediately in and following their name and text. This stretches out the post somewhat, but it seemed cleaner to me than asking you to sync text with gallery images. Click on the images to view enlargements. I like having a framework for my projects, especially if they fill a journal or sketchbook … something overarching to unify it. A few years ago I chose a single subject matter, self-portraits, but using various media. 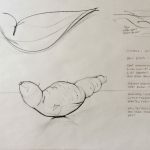 This year Jennifer put out a challenge in our Facebook group to draw “organic shapes from observation”. This was serendipity… I now had a theme, I wanted to practice various ink techniques including using acrylic inks as I would watercolor, and I had a journal with pre-painted spreads that I created in Roz’s online “Textures” class. It had been calling to me but over and over I had passed it up feeling too intimidated… I was determined to use it and this was the perfect occasion. I don’t know quite what to call it… was it coincidence or synchronicity? Who knows but I melded it all into one project. 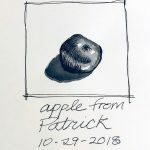 Dana posted a video flip through of her entire “Daily Potato” which she did for InkTober 2018 here. 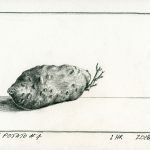 The Daily Potato, it’s such a simple, great idea. 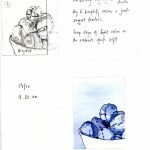 I jumped into this project as it removed all problems of “what shall I draw today.” There is always something in the fruit bowl or fridge. I decided that each picture had to have a goal or focus: trying a different material, practicing an aspect of drawing such as gesture drawing, or working on page design. Setting a focus really helps. I didn’t worry about the “daily” bit, as I have found on previous projects that it doesn’t suit me. Daily is restrictive and makes me grumpy. Instead, I extended the period of the project and aimed to do at least 30. This gets me better results, with no negativity about missing days. 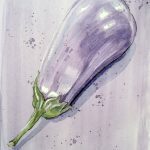 I draw something every day but I like to be flexible about subject matter. I like to be able to make the most of any drawing opportunity that a day offers, rather than setting restrictions. So, if I’m in town, it’s urban sketching. If the weather is good, it’s out for some landscape. If I’m at home…it’s the potato! Image copyright 2018 Katie Clare. I’m still happily Potatoing. It is an easy way to maintain a regular practice, helping to improve my observation skills and hand/eye coordination. Working in a series like this certainly pushes me onwards, as I have to keep coming up with new approaches. 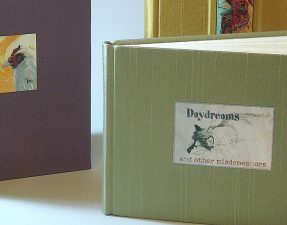 I’ve been working my way through all my materials, including printing and collage. My biggest discovery so far is that I like dip pens and charcoal/ pastels. I’m embracing the mess! Some of my images can be found on my instagram, click here. Image copyright 2018 Catherine Ednie. 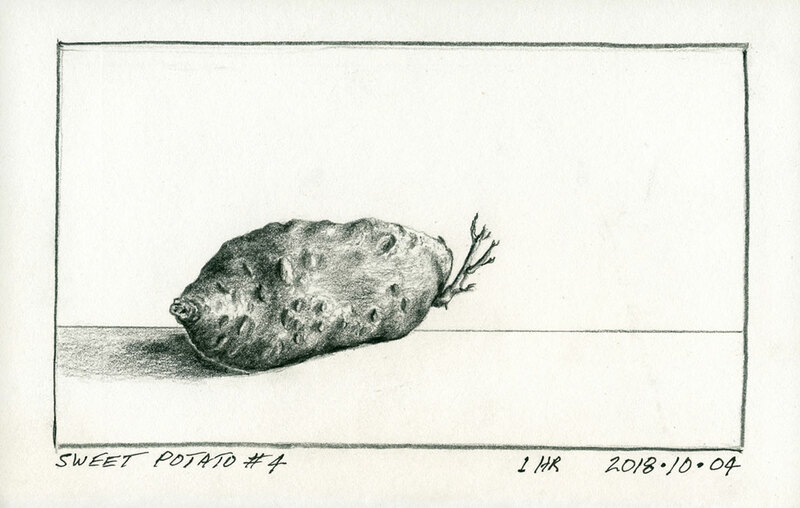 I really enjoyed the #DailyPotato challenge. I completed all 30 days and carried it into November as well. I grow fruits and vegetables here in rural Maine and during harvest season there are always a lot of them around. This made choosing subject matter very easy for me. 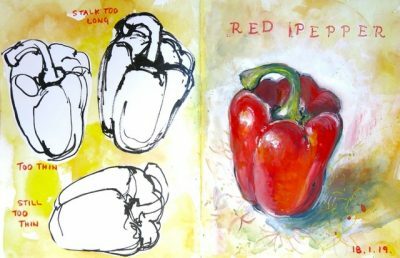 I worked in a simple 5.5 x 8.5 sketchbook with 60 lb. paper. 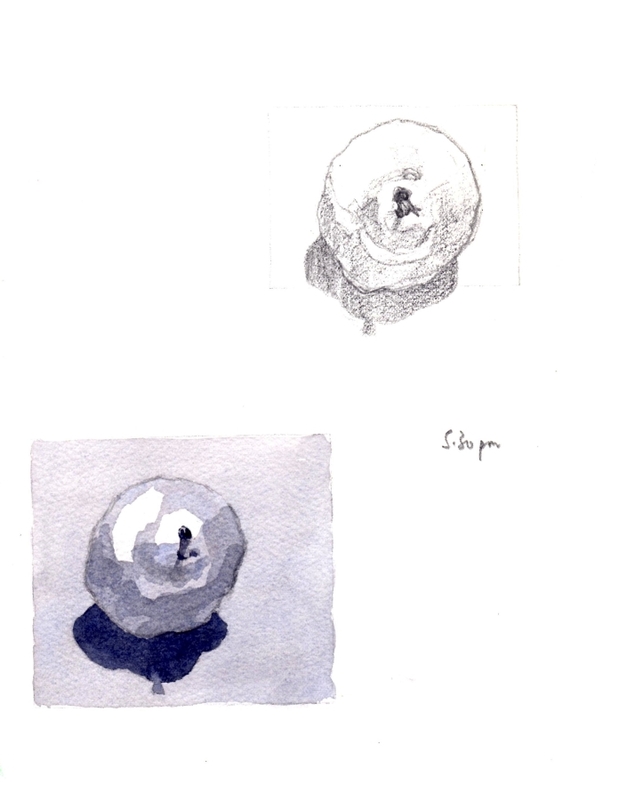 My tools were primarily watersoluble pencil and ink, with water brush applied to bring out shapes and shadows. I really learned a lot about rendering rounded forms, highlights, and shadow shapes. 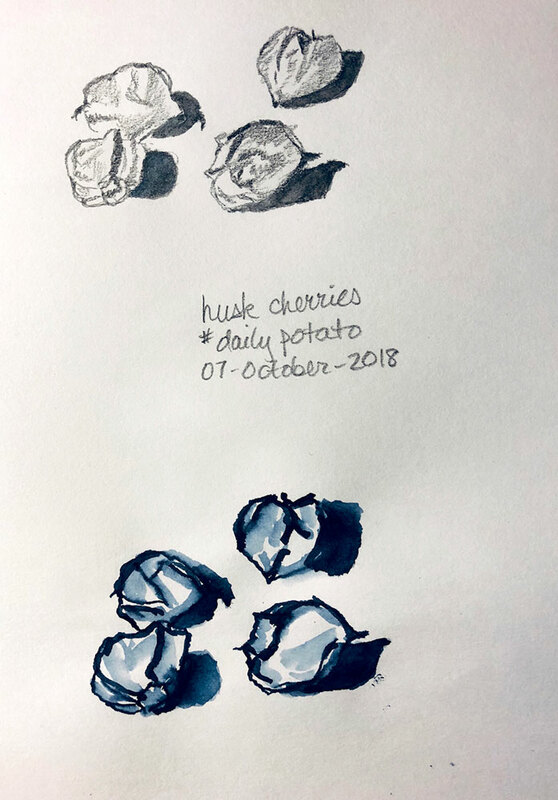 Husk Cherries: Early in the challenge, I often drew the same subject in both pencil and pen to experience differences in the two media. 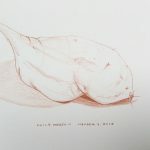 Red Kuri Squash and Strawberry: Both subjects are red, but I was working monochromatically to remove color decisions from the process. I wanted to focus on shape and shading. Here I was going for more subtle shadows. 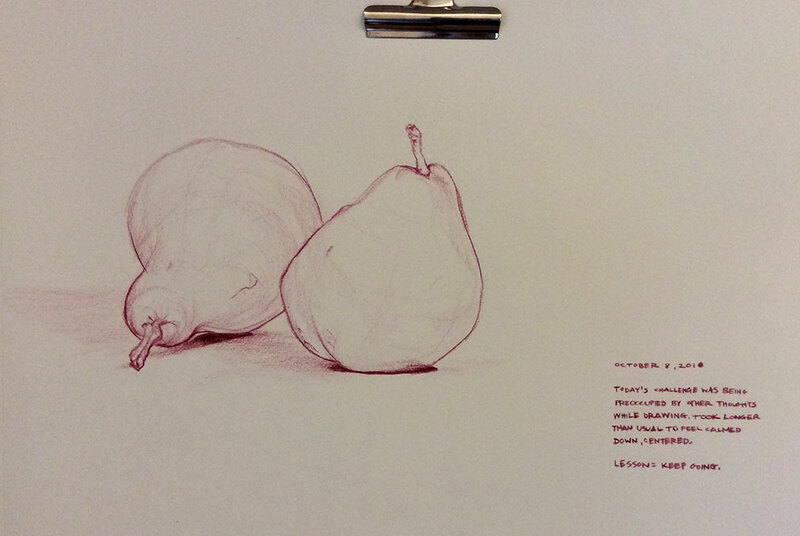 Apple: Near the end of the challenge, I was focusing on rendering highlights in my drawing. Image copyright 2018 Hero Lotti. 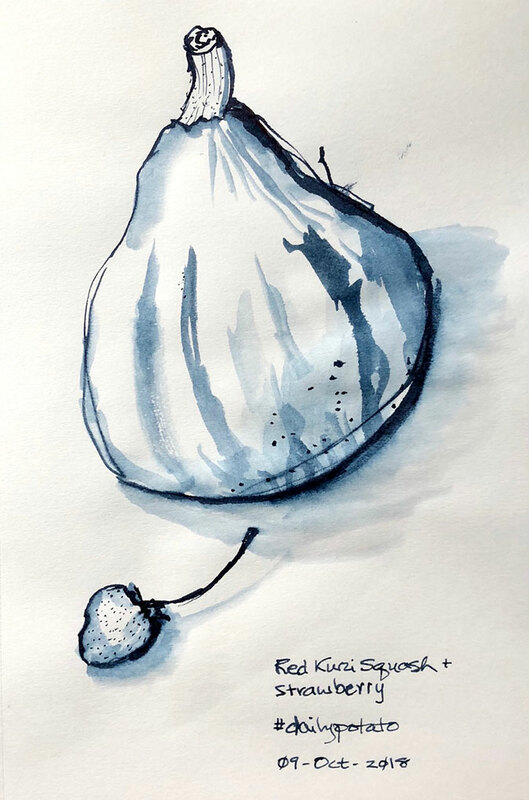 Pear, 17/11 (I can’t remember if ‘Daily Potato’ was still going then, I carried on after it finished), Pencil and watercolour. 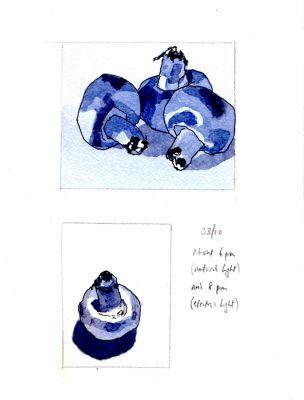 I was already trying to work on values by doing monochrome studies, on watercolour technique, and was starting to think more about composition. I liked Jennifer’s Daily Potato idea because I thought I could work on these things and at the same time join in with the group. 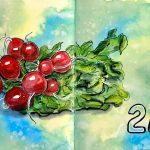 Not only did the idea fit in with what I wanted to do, it helped me by limiting the subject matter to items of fruit and vegetables (which I always enjoy drawing) so that I didn’t spend too much time thinking about what to draw. Having a clear focus, and it being not just a solitary but group project were both helpful, and at the beginning of the month I had a fair amount of time to draw each day. I look back on it as a few weeks when I made quite a lot of progress. 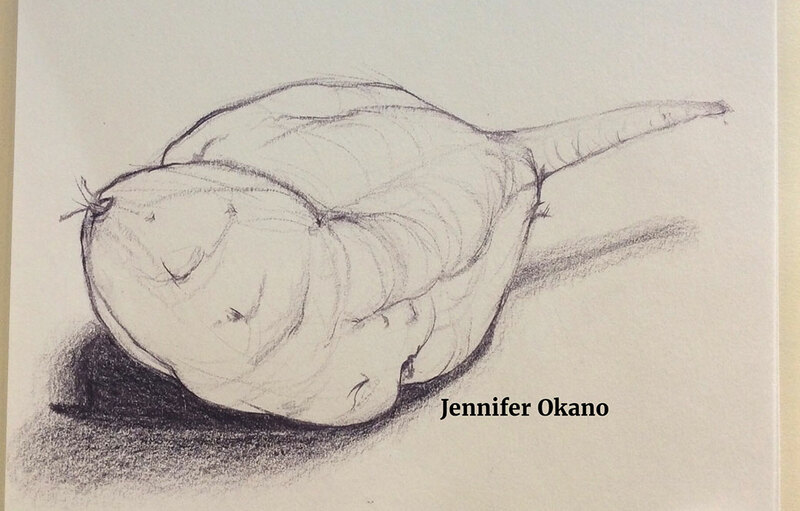 Image copyright 2018 Jennifer Okano. Image copyright 2018 Alissa Saunders. 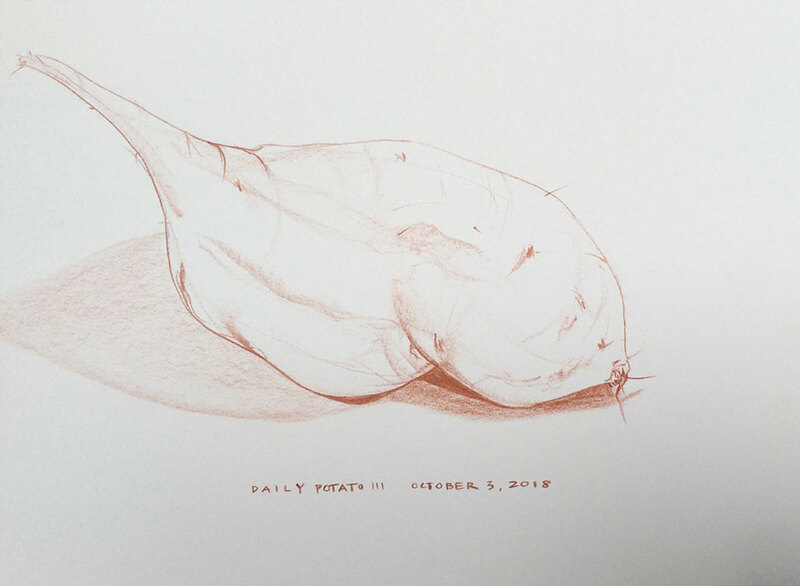 The daily potato challenge this past October was a great extension of my daily sketching from life practice, which I have been keeping up with since Drawing Practice 2015. 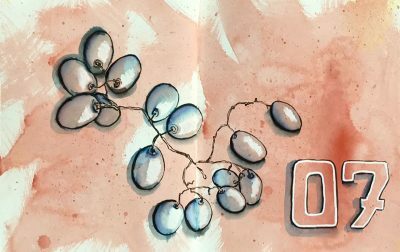 Prior to this challenge, I had mostly been using watercolor and wanted to get back into drawing with ink. As I love sketching produce, I thought it would be fun to combine this challenge with Inktober. 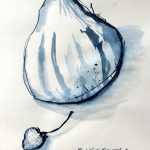 I began the monthly challenge by predominantly using black ink and a dip pen, however, towards the end of the month, I started incorporating white ink and watercolor. 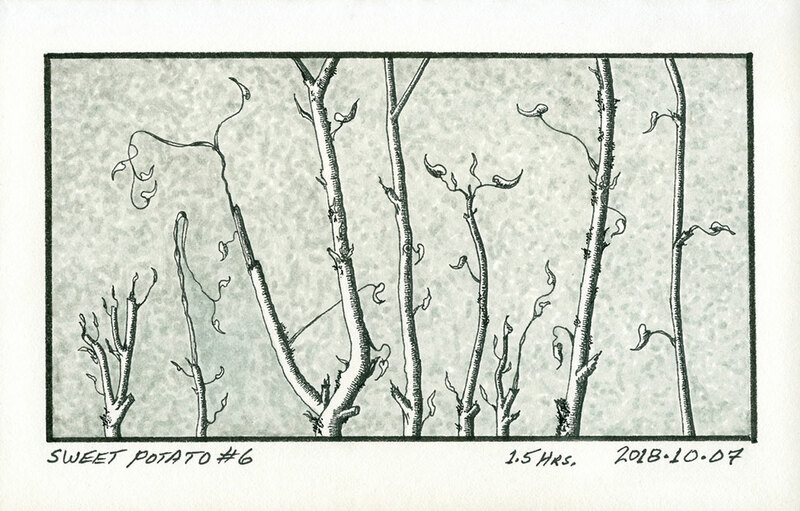 Image copyright 2018 Paul Savoie. 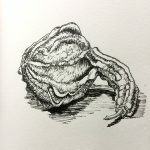 I decided to participate #dailypotato because I know from past experience that working on a series challenges you to see more deeply. 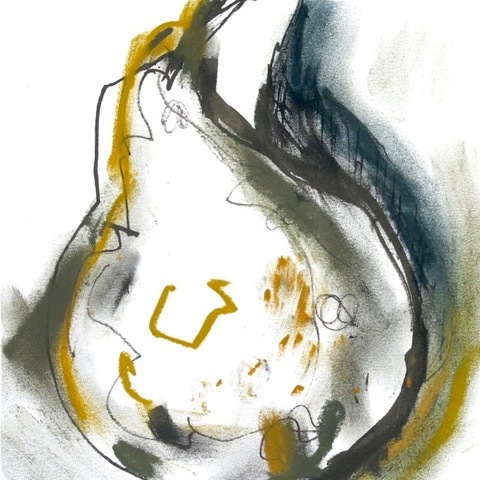 Focused observation when drawing reveals beauty in the everyday and allows you to be truly in the present moment. Life is enriched by celebrating the “mundane” in a sketchbook. Time spent drawing/painting is a priceless gift you give yourself. There is no better way to connect with ANY subject, including the humble potato! 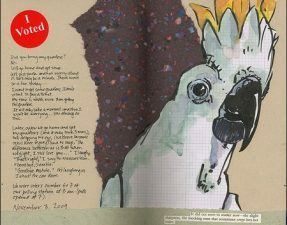 Image copyright 2018 Susan Sutcliffe. I wanted to join Jennifer’s daily potato challenge because I wanted to participate in Inktober but didn’t want to do prompts, and because lately I have been drawing mainly people and animals and wanted to shake things up a bit. Materials: I challenged myself to use a very inexpensive sketchbook with smooth, toned paper that didn’t like water media much. 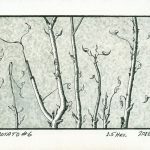 Each drawing was done in ink (black, sepia, or white) first: fineliner, dip pen/ink, fountain pen, or PPBP. 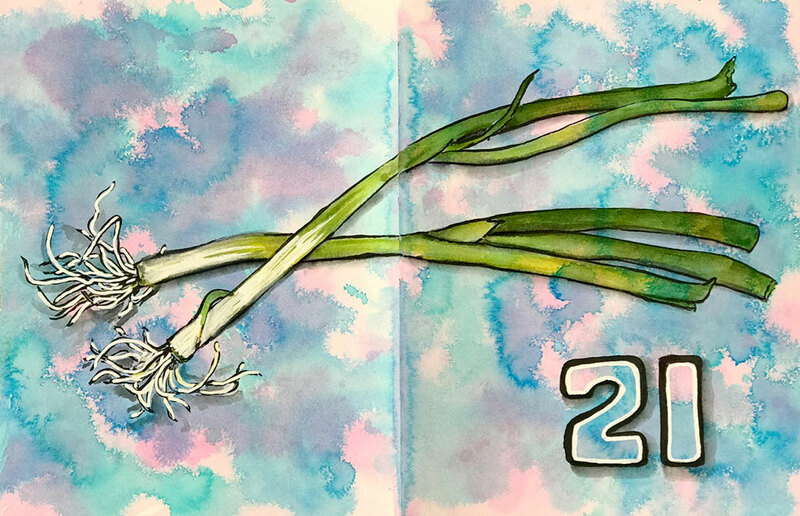 I experimented with different materials to add colour and volume: brush pens, acrylic and chalk markers, dilute ink, coloured pencils, Inktense pencils, and white ink. I also used stamp pad ink to prepare the some of the backgrounds. 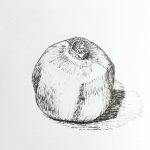 Subjects: I initially stayed close to the daily potato theme, drawing potato, sweet potato, pears, ginger, tomatoes, and onions. Then I branched out (pun intended) to include twigs and fallen leaves that had been run over or walked on. At the end I was really pleased that I had kept going despite some of the difficulties I encountered with the paper. In a way, using this different paper freed me up to be more experimental, and I didn’t really mind when things didn’t work out. I felt I learned something from every drawing I made. 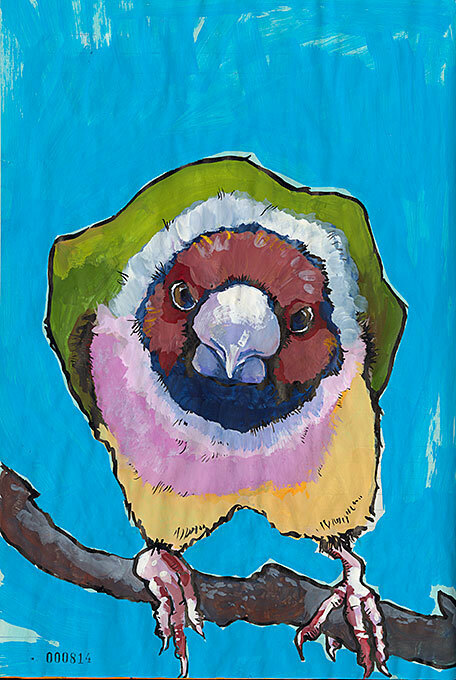 I loved the dip pen/ink on this paper, and also the markers, some of the brush pens, and coloured pencils. 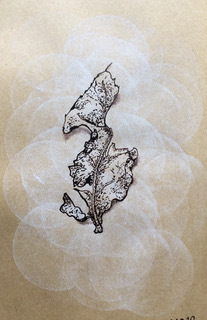 I also discovered that I love drawing decrepit leaves (who knew? 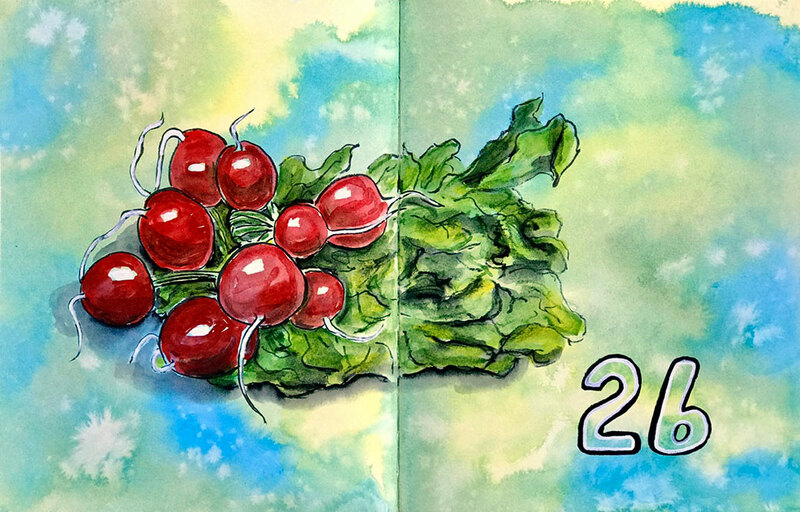 ), but I still would rather draw people and animals than fruits/vegetables. 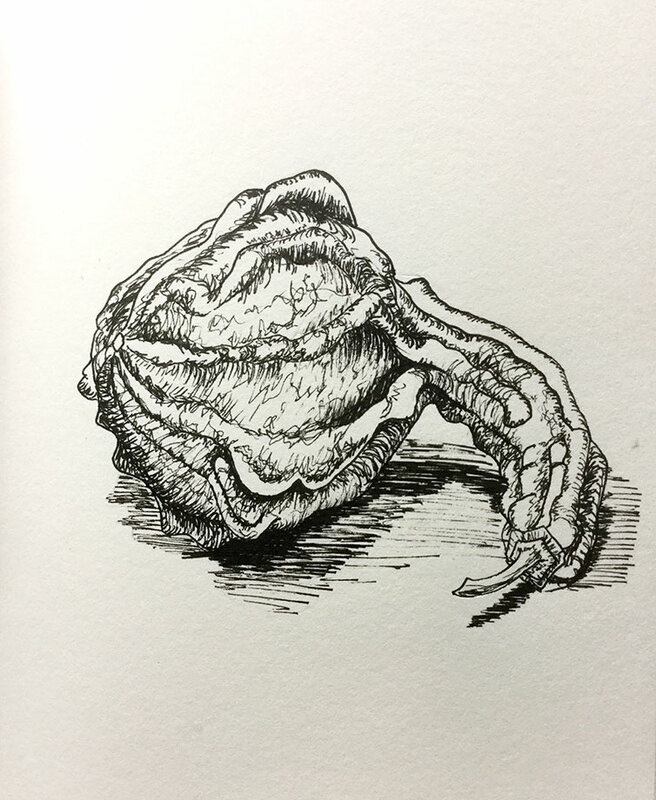 As a result of this project I knew that I wanted to continue to use toned paper (sometimes), make a point of using dip pen/ink more often, improve my cross hatching skills, and keep experimenting. 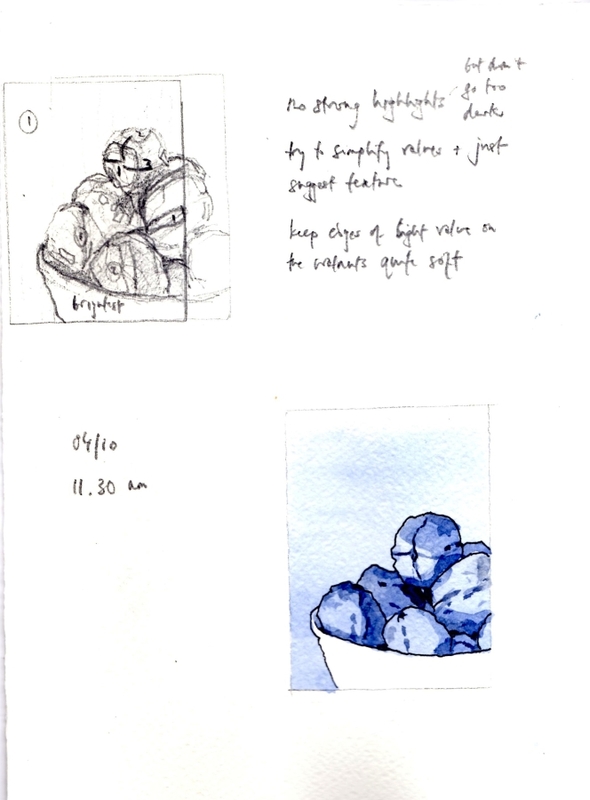 It was fun to look back at my sketches from that time and the evaluation I did at the end. It was a fun project. Previous post: In Context: I’m Going To Die In This House! These are wonderful! Thanks for sharing them! I often get so caught up in designing the things I’m building that I forget to draw from observation. This reminds me of how fun and valuable that kind of drawing is! Yep, direct observation is always the best drawing practice. 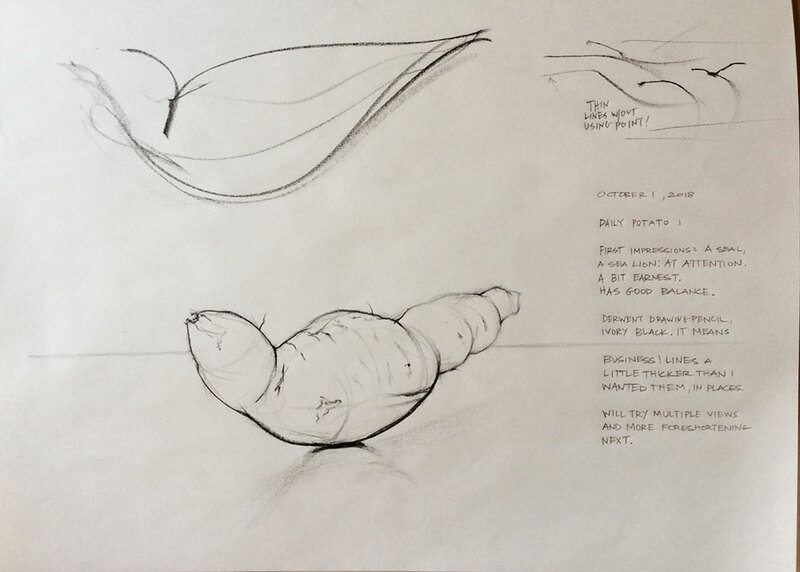 I hope you have some fun sketching produce soon. This is great, Roz – thanks for posting this. 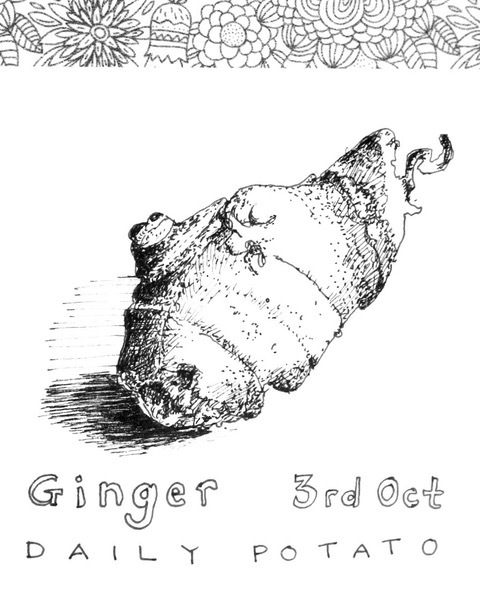 This reminds me how much I enjoy drawing fruit + veg, yet somehow it has fallen off the map. I just went grocery shopping today, so this is a timely post! 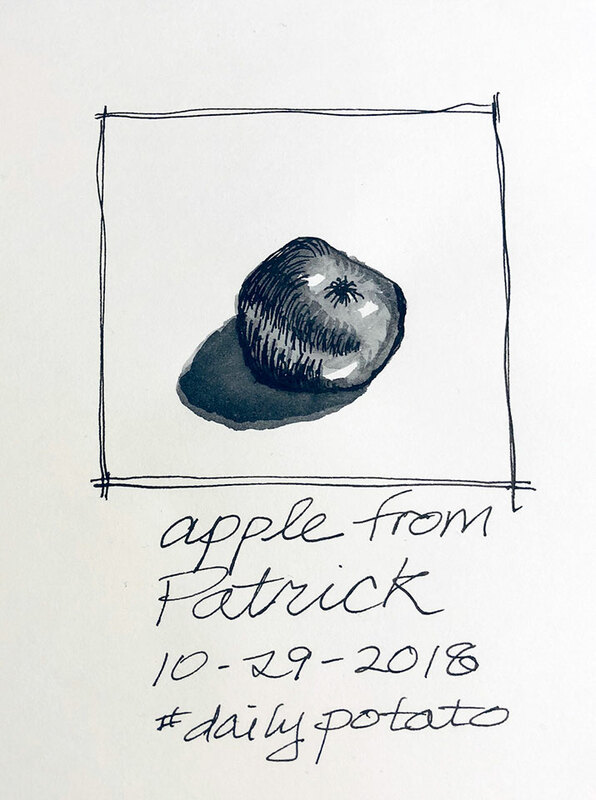 Hope you have fun getting back to sketching produce!